We all like a joke about dog farts and may even blame a whiff in our house on the dog but excessive flatulence in dogs is no laughing matter. It can cause owners and the dogs themselves a lot of distress and can be very unpleasant. It can also be a sign that something is wrong with your dog’s lifestyle, diet or health. The cause of the flatulence could be something as simple as your pooch eating too quickly and gulping air with the food. On the other hand, it could be something in their diet that is causing the problem. Many owners have found that a change in diet can improve the situation a lot. There are some commercial dog foods that are particularly suitable for gassy dogs and which can play a role in reducing flatulence. Here’s our guide to our top five best dog food to prevent gas. Formulated to replicate a wild dog’s diet, the main protein ingredient in this recipe is sustainably sourced salmon. Some are wild caught and some are farmed. This food for gassy dogs provides the perfect profile of amino acids for supporting lean muscle growth and development. To support healthy digestion, it contains a special blend of probiotics which are added after the cooking process so that they are fully active. 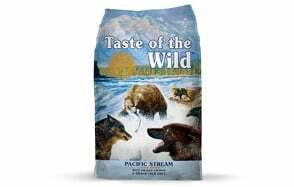 Every pound of the kibble contains 80 million live and active cultures. To further support the friendly bacteria in your dog’s digestive system, the recipe contains dried chicory root. Both the protein and carbohydrate content (provided by ingredients such as sweet potatoes) are easy to digest. There are no ingredients that could trigger digestive allergic responses such as corn and wheat grains and filler. 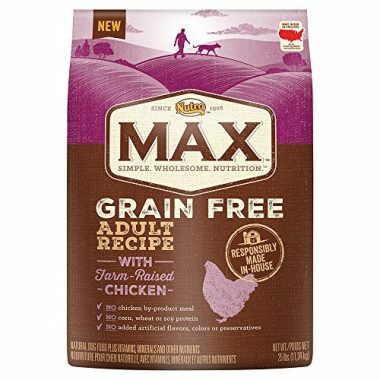 This is a dog food that helps with gas because the food is made from a limited number of ingredients so there are fewer things that can cause intestinal issues. The main meat protein source is deboned turkey which is a very high-quality protein source. The carbohydrates are easy to digest (potatoes) and promote a healthy digestion (pumpkin). All of the ingredients have been selected with care so that they are suitable for dogs with allergies and sensitivities. Therefore, it contains no chicken or beef and has no corn, wheat or soy. It also has no dairy products or eggs and no artificial flavors or preservatives. The protein in this recipe is obtained from farm-raised chicken, chicken meal and lamb meal. The vegetables provide much of the carbohydrates and include dried potatoes and chickpeas which are easy on your dog’s digestion. 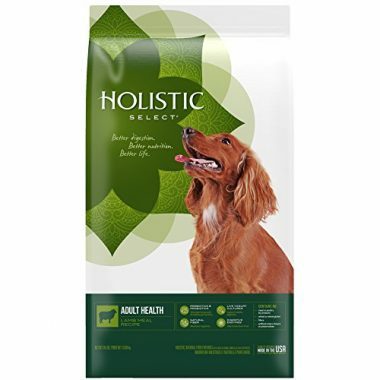 All of the ingredients are natural and carefully sourced to ensure a high-quality product that will support your dog’s intestines and help to avoid stomach upsets. 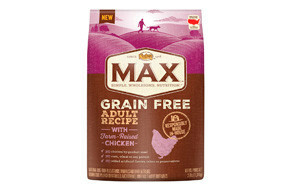 The formulation contains no chicken by-product meal, no corn, no wheat, and no soy. There are no artificial colors or flavors and no genetically modified ingredients. It is, therefore, suitable for most dogs with food allergies. 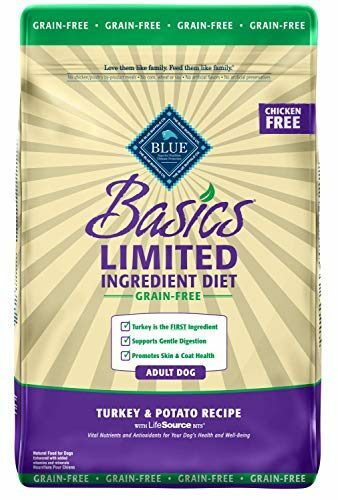 A limited-ingredient yet balance dog food to reduce gas that is formulated to promote intestinal health and is suitable for dogs with food sensitivities and allergies. The primary ingredients are salmon and salmon meal which provide plenty of protein as well as vitamins and minerals. The carbohydrate element is predominantly ground rice which is easy for the gut to digest. There are probiotics (such as dried Lactobacillus casei) to support a healthy gut as well as prebiotic fiber which is provided by chicory root. It contains none of the most common allergens that can cause digestive issues in dogs including meat by-products, wheat (gluten), corn, soy, dairy products, and eggs. 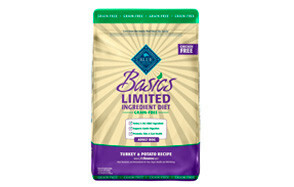 A single-protein dry dog food that contains lamb meal as the primary protein source. The vegetables in the recipe include pumpkins which are highly digestible. The recipe is formulated specifically to support digestive health so that your dog’s gut can break down the food and absorb more of the nutrients. It also helps to move food through the body effectively so that gas does not build up in the digestive tract and lead to flatulence and bloating. 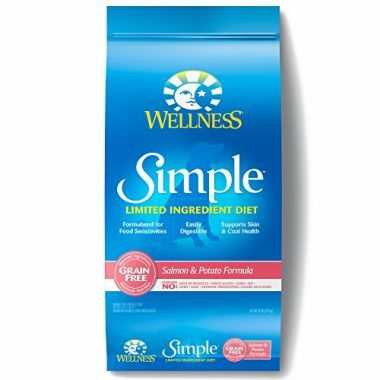 This is achieved through a carefully balanced blend of pre- and pro-biotics and natural fiber. There are also digestive enzymes (to help with breaking down starch and cellulose) and digestive botanicals. Appropriate dog food can play a big part in reducing your dog’s flatulence. There are several things that you should look out for in the best dog food to prevent gas. High-quality protein. The protein in the food should be provided by a high-quality meat source. A lot of red meat can make flatulence worse so you should be looking for white meat or fish as the main protein ingredient. If a meat by-product is the first ingredient on the list, it is best avoided. Easy to digest carbohydrates. Carbohydrates can be tricky for some dogs to digest so choose a food that has easy to digest carbohydrates. Ground rice and sweet potatoes are good options. If one source of carbohydrate doesn’t work, try another one. Avoid ash or fillers of any kind because they can trigger stomach problems. Artificial additives. There is no need for artificial ingredients to be added to dog food. It is best to choose a food with natural ingredients. Fat and fiber. High fat and high fiber diets can make flatulence worse so check out the proportion of these nutrients in the food. Allergies and food sensitivities can cause stomach upsets and flatulence can be a part of that. If you suspect that your pooch has a food allergy, it is important that you speak to your vet. They will be able to advise you on how to tackle the problem. Once an allergy has been identified, it is important that you read ingredients lists carefully. You may need to avoid grains such as corn or wheat or soy. The gut has natural bacteria living in it which help to digest our food. Some foods contain cultures of these friendly bacteria and so help to maintain the natural colonies. This can help with a healthy digestion and to control flatulence. Association of American Feed Control Officials. This is the organization that oversees animal food labeling. If the food is approved by them, you know it has met certain standards. A certain amount of flatulence is perfectly normal and healthy. The occasional dog fart may be a bit unpleasant but is nothing to get too worried about. However, when your pooch has excessive flatulence and is causing a constant stink in your home, it is time to do something about it. Usually, all it takes is a few simple interventions. First, you need to find out what is causing the problem. Here are some of the most common reasons for dog flatulence. When a dog eats very quickly, they tend to swallow a lot of air as well as food. Some will come back up as a burp but the rest will make its way down into the colon (large intestine) and out of the bowel as a fart. This type of flatulence is not as smelly but does have a big volume! Any type of respiratory disease that makes your pooch breath faster can also cause them to gulp a lot of air as they are eating. The same can happen if you feed them too soon after they have exercised and they are still breathing hard. The brachycephalic breeds have short nasal passages because of the shape of their face and they swallow a lot of air when eating which makes them gassy. Luckily, there is something that you can do about dog flatulence caused by rushed eating. You can buy a bowl that is designed to make your dog eat more slowly. It will have some sort of obstacle to prevent your dog from reaching all of the food too easily. In the meantime, you can place a large stone in their food bowl which will get in their way and stop them from gulping down their food. The stone must be clean and it must be so big that it would be impossible for your dog to get it in their mouth. Smaller stones would be a choking hazard for your pooch. You can also leave a while between exercise and feeding so your dog has a chance to regulate their breathing. Not all dog foods are the same! The lower quality foods contain fiber that ferments in the intestines and produces a lot of gas. Fibrous food cannot be absorbed by the small intestine and makes its way to the colon (large intestine). Here there are lots of bacteria that get to work on it but that process produces a lot of gas. The less food that reaches these bacteria, the less gas will be produced. High-quality food has less of this fiber and so cuts down on gas. You can spot a high-quality food by looking at the ingredients list. A high-quality food will have one or two meat or fish ingredients as the first entry on the list. Then there should be vegetables that sound familiar to you such as sweet potatoes. It is best to avoid recipes that have a lot of fermentable fiber such as inulin, plant gums, oats and barley. Look for foods that describe their carbohydrate content as ‘highly digestible’ because that means that most of it will be absorbed in the small intestine. Most dogs need a source of meat in their diet to provide high-quality protein but too much meat can cause flatulence that has a particularly unpleasant smell! Meat contains sulfur and red meat contains more than white meat. When sulfur reaches the gut, bacteria start to break it down and give off a very stinky gas. You could try switching to a food that has around 25 % protein provided from a non-red meat source. Chicken and turkey are possible alternatives as are fish and even vegetable protein. Milk is the natural diet of puppies and their bodies are able to digest it very well. This is because they make an enzyme called lactase which can break down the sugar in milk called lactose. In adult dogs, the production of lactase is limited and if they have very little of it they cannot break down lactose at all. Dogs who have this condition are called lactose intolerant. Any lactose in their diet is not broken down at all by their small intestine as it should be. Instead, it travels to the large intestine. There are bacteria here which feed off it and produce a lot of gas whilst they are doing so! You can prevent this cause of flatulence by eliminating milk and dairy products from your dog’s diet. Few commercial pet foods contain dairy but it is worth checking. Don’t feed your dog with your own cheese, yogurt or ice-cream. 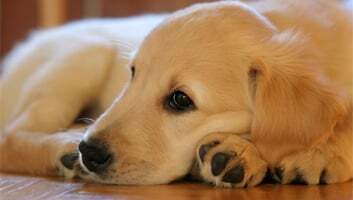 Dogs are similar to humans in that some of them simply have stomachs and intestines that cannot cope with a wide variety of foods or which have a problem with particular ingredients. This is often because some foods make the gut work very hard to digest them. Excessive gas production can be a symptom of that. You may be able to associate gas production with them eating a particular food. The best approach is to eliminate unnecessary extras from their diet. Just give them one brand of dog food and water. Cut out all table scraps and treats and stop your dog from scavenging food from the kitchen floor and yard. Watch out for what they may be eating when you are out on walks. Hopefully, the flatulence problem will disappear in a few weeks of following this routine. If you wish, you can gradually re-introduce treats one at a time to see if they trigger a return of flatulence. If it does return, at least you know what is causing it! Bacterial overgrowth in the small intestine. With most of these diseases, you would expect to see other symptoms as well. The persistent flatulence would be accompanied by weight loss, a change in appetite, vomiting or diarrhea. You need to discuss this with your vet as soon as possible. Feed a high-quality diet. Your dog needs a nutritious and highly digestible food. Your vet can give you more information on what to give dogs for gas. It will involve you researching what is right for their breed, age, and lifestyle. Foods that make your dog feel full but which are nutritionally poor will just make the problem worse. Stop the table scraps. Don’t feed your dog human food from your own plate. Many human foods can trigger intestinal problems in dogs. Keep an eye on scavenging. Some dogs are natural and enthusiastic scavengers but it is not necessarily good for them. You can cut down on scavenging by putting lids on the garbage cans and watching what they are eating on the sidewalk or in the park. Coprophagia (eating poop) can also make flatulence worse and should be avoided. Slow down their eating. Stop your dog from eating too fast by feeding several smaller meals rather than one big one. You can also use a special bowl to slow down feeding. Make eating relaxed. Feed your dog in a quiet and relaxed area of the house where they are not competing with other dogs for food. Identify food allergies. Work with your vet to find out which food ingredient is causing an allergic reaction in your dog. Then get in the habit of reading food labels. You may need to avoid milk and dairy products, eggs, corn, wheat, chicken or soy. Alternative protein. If your dog seems to be reacting to red meat, choose a food that has white meat or fish as the protein source. Promote a healthy lifestyle. Make sure that your dog gets the levels of exercise that is suitable for their breed. Hopefully, a lot of the dog farts will happen when they are outside! Medication. Your vet may be able to prescribe a dog flatulence remedy as a last resort. Treatment that has been useful in some dogs includes zinc acetate, Yucca schidigera, and dry activated charcoal but there are many more options. Once you have tried to sort out the issue of your gassy dog yourself with some diet and lifestyle changes, the issue should settle down. However, if your dog’s excessive flatulence persists, it is time to see your vet. They will ask you some questions and may want to carry out some tests. They will be able to identify if there is a medical problem that is causing your dog’s gut to create a lot of gas and will prescribe the appropriate treatment. 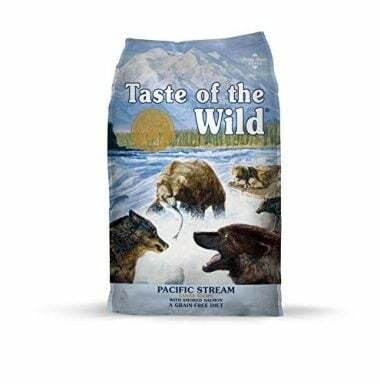 The recipe of this best dog food – Taste Of The Wild Grain-Free Premium Dry Dog Food – for flatulence is based on the diet of a wild dog. There is no red meat, the protein is provided by wild caught and farmed salmon. To support healthy digestion, it contains a special blend of probiotics with live cultures that are added after the cooking process to maintain their viability. Dried chicory root is added to the recipe to support the friendly bacteria. It is formulated so that it is easy to digest. Many ingredients that could trigger an allergic reaction have been excluded including wheat grains and filler.